A young man and his Angel bride must stop an angry Archangel from destroying Earth by proving that love is the ultimate force in the universe. A college student receives an unexpected wish from a goddess and asks her to stay with him forever, but that brings complications. An alien who becomes a teacher, and a student start a relationship and have to keep it all secret. Oh my goodness, an Oh My Goddess movie! Based on the OAV series, this one takes a few years after the series. Now a new semester on college, and a few members on the Motor club, this one is about Belldandy's teacher Celestin, he comes back, a little reunion, but there seems to be something wrong with him, he's wanted, and gives Belldandy amnesia. What is Keichi to do? what is Celestin's sinister plan, and does the new member of the Motor club have something to do with it? A wonderful movie, and beautiful and improved animation, and the characters are just marvelous, and Keiichi kind of looks like Tenchi now, and that girl Morgan looks like Motoko of Love Hina. 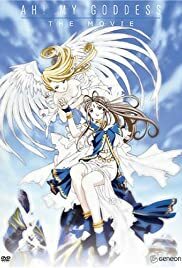 And in this one, they tell the history and background of Belldandy and the other goddesses, a must see for the fans of the show. Watch it.